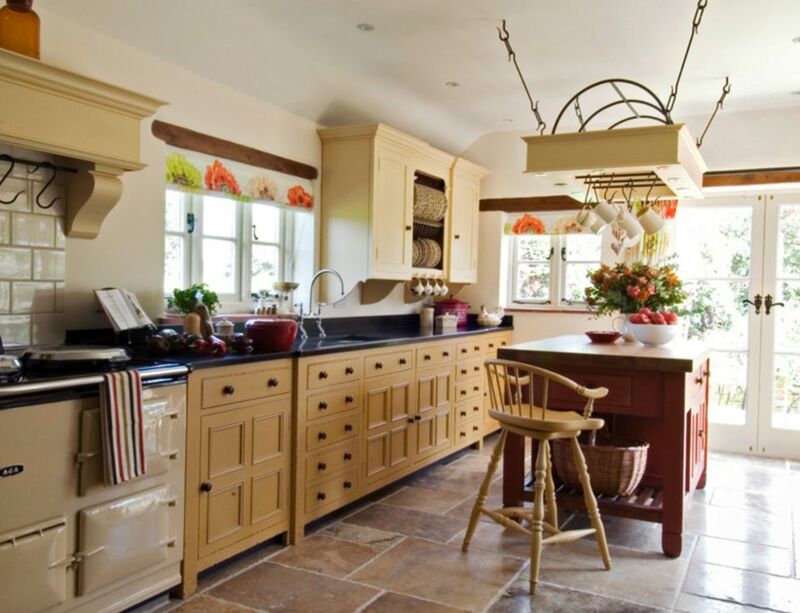 Freestanding Kitchen Cabinets in Natural Wood Finish. From the 1950s onward, standard kitchens have usually consisted of stock cabinets with finished front faces and rough sides and backs. The units are joined end-to-end and anchored to walls along the backs to form the illusion of a seamless line of cabinetry. Recently, though, the popularity of large kitchen islands has prompted a resurgence in a form of cabinetry that was once the norm in kitchens up to the early 1950s—the freestanding cabinet that stands on legs with finished faces on all four sides. At one time, you had no choice: every kitchen was a freestanding kitchen. In most pre-World War II kitchens, all items were free-standing and moveable: table, pantry, refrigerator, stove, and storage cabinets. Only the sink was fixed in place, and that was because it was attached to the house by plumbing. During the 1940s, continuous metal kitchen cabinets began to appear in American kitchens, the result of innovations in mass production brought about by the war materials industry. Post World War II, these wraparound cabinets, with their seamless countertops, were found in newer kitchens nearly everywhere. If you had freestanding cabinets, you were deemed highly impractical--or worse, seriously out of fashion. The 1950s saw the rise of kitchen remodeling—both do-it-yourself and pro-hired—as a favorite American pastime. As homeowners, often armed with copies of Popular Mechanics, began to personally take control of the look of their kitchens, installation professionals were no longer craftsmen who designed and built free-standing cabinets, but rather installation specialists who sized and installed factory-built stock cabinets—cabinets that were manufactured with the aim of low cost. The standard cabinets were no longer freestanding units with four finished sides, but simple box carcasses with finished front faces only, resting on the floor and anchored to walls. In the early part of the 21st century, home design began to call for larger kitchens, and the widespread use of kitchen islands came into play. In some homes, these islands became large enough to represent a majority of the kitchen workspace. Large islands these days may incorporate the kitchen sink, the cooking range, eating countertop space, and a good portion of the cabinet storage territory. In such a kitchen configuration, standard stock cabinets with only a finished front face are no longer practical, since three sides, or sometimes even all four sides of the cabinets may be exposed. This has given birth to the concept of the freestanding kitchen—which is often defined as a kitchen in which a large island is the center of the design. Many kitchens these days make use of freestanding cabinets not only for the center island, but also around the perimeter, where the freestanding cabinets are butted together side to side in the same manner as stock cabinets. Although rare, freestanding cabinets also give homeowners the option of shifting up the layout of a kitchen, much the way living room furniture can be rearranged from time to time. Thus, kitchens have gradually returned to a prewar aesthetic, in which the freestanding cabinet is once again at the forefront of kitchen design. Many kitchens lean even further toward that aesthetic, using old-style subway tile backsplashes, wide-plank floors, and other accouterments of old-style kitchens. Classic style. Most homeowners choose freestanding cabinets because they want their cabinets to impart a traditional style. Easier cleaning. Because they stand on legs and have no toekick space, these cabinets make it possible to mop or dust all the way beneath the cabinet. Layout flexibilty. Many (but not all) manufacturers produce these cabinets as true pieces of furniture, finished on all sides. This means that you can back them up to a wall or place them in the center of the room. Conventional cabinets, by contrast, have a particle board or thin plywood backing that is not suitable for viewing. These cabinets can also be moved about, should you ever want to change the layout of your kitchen. Normally, major kitchen remodeling requires that old cabinets be discarded, but when revising a freestanding kitchen, it is often possible to reuse the existing cabinets. There are, of course, disadvantages to a freestanding kitchen. Cabinetry is more expensive. Because all four sides have finished faces, the cost of materials and construction labor is more expensive with freestanding cabinets. Freestanding cabinets always tend to be more expensive than conventional cabinets. Selection is limited. There are both fewer manufacturers offering freestanding cabinets, and relatively small product line selections available from those companies that do offer freestanding units. Ready-to-assemble (RTA) companies, one proven avenue for finding cheaper cabinets, tend to have paltry freestanding offerings or none at all. While conventional cabinets are actually easier to install than most people realize, installation of freestanding cabinets is even easier. Leveling of freestanding cabinets is usually done by screws located within the cabinets that are adjusted by means of an Allen wrench. For cabinet-to-cabinet connections after leveling, some manufacturers provide special fasteners that positively lock the two pieces in place while minimizing marring. If no fasteners are provided, cabinets can be joined using screws driven between adjoining cabinets from the inside. If desired, cabinets can also be anchored to the back wall, much the same way as is done with conventional cabinets. Lizell Mill Studio: Lizell's tagline is "Innovation By Simplicity." This Pennsylvania-based company makes cabinets using "old-fashioned, traditional construction methods such as mortise and tenon joinery and dovetailing," according to their website. Chalon: UK-based Chalon produces gorgeous, unique, handcrafted freestanding units (among other pieces). GD Arredementi. This company makes the Fortuna line of freestanding cabinets, designed by Luciano Dal Bello. Colombini. Offers Italian-style freestanding cabinets in several lines. Gamadecor. An Italian manufacturer offering several lines of modern freestanding cabinets.